What makes WiFi faster at home than at a coffee shop? How does Google order search results? Why do Amazon, Netflix, and YouTube use fundamentally different rating and recommendation methods?and why does it matter? Is it really true that everyone on Facebook is connected in six steps or less? And how do cat videos?or anything else?go viral? The Power of Networks answers questions like these for the first time in a way that all of us can understand and use, whether at home, the office, or school. Using simple language, analogies, stories, hundreds of illustrations, and no more math than simple addition and multiplication, Christopher Brinton and Mung Chiang provide a smart but accessible introduction to the handful of big ideas that drive the technical and social networks we use every day?from cellular phone networks and cloud computing to the Internet and social media platforms. Networks are everywhere. 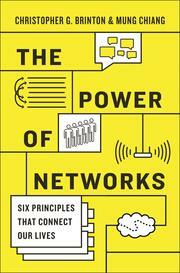 The Power of Networks shows how they work?and what understanding them can do for you.